Appealing to emotions is a crucial part of advertising, and this can be especially true in more “boring” categories. If an advertisement can assign a sentimental value to something that is typically thought of as practical, it’s a great strategic advantage. 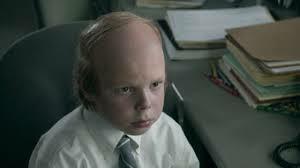 This is very apparent in a new commercial from Extra Gum, created by Energy BBDO Chicago. Gum might not be the most exciting item, and its sales have been falling in recent years. So Extra falls on its classic identity of a long-lasting gum in an unexpected way. The spot starts with a father teaching his young daughter how to make a paper crane with his gum wrapper, and she starts making her own. Time marches on, and the birds become something of a collector’s item for the girl as she grows up. Finally, the parents are packing the car to send her off to college, when the father drops a box…and then finds that it’s full of paper cranes. If that was a reference to the thousand paper cranes legend, it’s a great one. The ad closes with a voiceover saying “sometimes the little things last the longest.” Overall, the spot has a similar message (though a less beautiful execution) to Vodafone’s ad from earlier this year. It’s a nice, sweet, sentimental commercial. Is it a little sappy? Yep. But a little sap isn’t so bad sometimes. I’m going to include a link to Adweek’s article, since they say pretty much everything I was going to. It’s a real nice spot for Heinz Beanz, a classic comfort food in the UK. Cute and charming without being cheesy. The Gap is a retailer who used to be huge in the commercial world, but not so much anymore. This very 1998 ad from Gap was a memorable moment in pop culture, solidifying khakis as a common pants selection, and propelling the fad of swing revival. The song is Louis Prima’s original recording of “Jump, Jive, An’ Wail” (later covered by The Brian Setzer Orchestra). And in case you were wondering, the dancers are doing the Lindy Hop. It’s a pretty common thing for kids to long for adulthood, while adults wish they had their childhood back. The truth is, there are upsides and downsides to both times of life. One of the common complaints about being an adult is that you have to work. Sure, you could luck out and get a job you love, but a lot of people have jobs that slowly crush the soul (well, if they have one at all.) This is the basis of a new Jell-O ad, created by Crispin Porter + Bogusky. A father and son are enjoying Jell-O together, and then dad tells son that being a grownup isn’t all that it’s cracked up to be. It’s hard to be funny and depressing at the same time, but this spot pulls it off. Remember CDs? I last bought one in 2004. I wonder if these commercials for the Buzz Series are still played on late night TV. The funny thing is that I still love a lot of these alt-rockish songs from the late ’90s and early 2000s (I totally listened to Lit’s “My Own Worst Enemy” today). Some technically aren’t great, but nostalgia is an amazing thing. I’ve had the TV on the background today, and have seen this commercial at least 3 times. 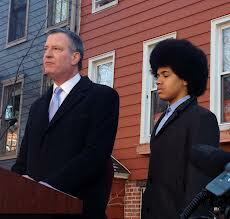 If I was actually registered in NYC, I’d strongly consider voting Bill de Blasio for Mayor. The reason? Well, his policies seem appealing. But also because Dante is his son, and Dante’s hair is just awesome. This new video from DirecTV, created by Grey New York, has become an instant hit…racking up more than 2 million views on YouTube since being released yesterday. I’m not sure I’d call it good, but it’s absurd, hilarious and massively memorable. Something you just can’t stop watching. 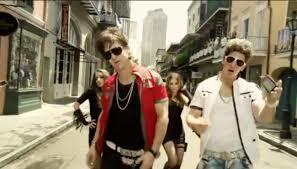 Peyton and Eli Manning have cultivated very goofy, marketable images that are on full display here. There’s even a cameo from their dad, Archie Manning. And the song is ridiculously catchy too. Did you know that you can watch football on your phone?